A guide to gas water heater troubleshooting. The most common problems; symptoms and causes. Troubleshooting low performance, insufficient hot water, pilot light problems, improper gas combustion, issues with the pilot light, thermocouple, gas burner, venting, and other common issues. Gas hot water heater troubleshooting guide will assume that the gas unit was correctly sized, professionally installed, per codes and manufacturers' instructions. The problems such as leaking, smelly water, noise, corrosion and other, similar to the problems found in electric units are described in this repair guide. Note: Before contacting a plumber or the licensed HVAC technician for the problems related to your gas heater, recommendation is to read the gas water heater troubleshooting guide found here, and the instructions from the manual (if you still have one) as it might help you understand the problem better and assist you in repair. If you need to inspect, test or repair the gas water heater always turn off the power, gas and water delivery to the unit. Smoking and carbon formation and combustion odor are problems related to gas water heaters, and are very dangerous for the user, if not resolved. This is why the gas water troubleshooting article puts these problems at the top of the list. Such problems should be carefully analyzed and treated with caution. If you find smoking and carbon deposits and smell the burning gas inside your home or room where the gas water heater is installed, make sure that there is no obstruction in the vents, flue baffle, and a gas burner. The venting path should be clean of any dirt, dust, and deposits. Preventive inspection and regular maintenance can reduce the risk. Insufficient fresh air supply, which can happen in the confined spaces, is another major cause of the sooting and combustion odor. Properly sized openings on the outside wall for the fresh air intake is one of the solutions. The manufacturer usually recommends the size of the openings, and how much air is needed for the proper combustion. Your gas unit might be receiving excessive gas pressure. Tighten the main burner or gas connection if loose. Replace the orifice if the unit is using an incorrect size. The main burner won't ignite because of the pilot light problems - this problem will be described below. If the main gas burner line is clogged, there is a dirt in the gas line, or pilot line, make sure to clean it all. Check if the thermostat is working and replace it if not. If it is malfunctioning, the whole gas control valve should be replaced. Inspect the thermocouple and replace it if it is broken or does not work properly. Also, make sure that it is positioned properly and the tip is not dirty. For gas water heaters installed in the confined areas, make sure to provide a good venting with sufficient air supply. Bleed the air from the gas line. Check if the igniter is working properly and generates sparks. Problems with the thermocouple. If the thermocouple is broken, replace it. If it is misaligned, position it properly. Tighten the loose connections. Is the venting correct? Lack of the fresh air will cause the pilot light outage. Check if the flame arrestor and filter are clean and free of lint, dust, and dirt. Replace the thermostat if it is broken or ECO switch is open. Find more details about troubleshooting pilot light problems here. Clean the tank from the sediment and lime build-up as the deposits reduce the gas hot water heater's efficiency. Use the draining and flushing guide to help you with the problem. Insulate the long pipes if they are exposed to cold weather. If it is needed, install the insulation blanket. Check the flue vents for the blockage and insufficient air supply. Clean the vents and flue baffle if needed. Check the thermostat and if it is calibrated improperly, replace it. If the burner flame floats, lifts off the ports or is too large, you might have an incorrectly installed burner orifice (too large) or the vent system is blocked. For the yellow lazy flame, clean the dirt from the burner gas supply line, clean the orifice, vent system and provide sufficient fresh air to the water heater. A new gas water heater is filled with the cold water and runs for the first time. The great amount of hot water is used in a short period of time, and the tank is refilled with the cold water. This is common on undersized gas water heaters. Most of today's heaters are energy efficient, high efficient or Energy Star water heaters, and since they work with the lower temperatures of the flue gases, condensation forms more often. Good venting is very important to carry away the flue gases and water vapor safely. Keep also in mind that the flue gases contain a large amount of water vapor, which is by its nature acidic. The acidic condensate can affect the metal surface by corroding it. It can usually be seen around the draft hood. The condensation problem should be eliminated or at least reduced, as the excessive condensation can cause the pilot light outage, sizzling noise on the burner and puddle of water under the unit. One of the simplest solutions for the water heater condensation is to increase the temperature settings if the temperature is too low. Check if there is a gas leak. Mix the soap and water in a spray bottle. Spray it on the gas connections (you can also apply the mixture with the sponge or paintbrush). It is easy to recognize if there is a leak because bubbles will form. Use the pipe wrench to tighten the fittings. The temperature setting could be set too high, but it is actually not heating water as expected, because the sediment build-up will act as an insulation between the gas burner and water, and will reduce the heat transfer. 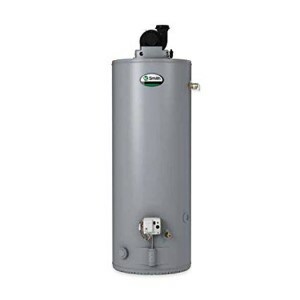 Gas water heaters are similar to its electric counterparts; they utilize the water storage tank, insulation, dip tube, anode rod, and TPR valve, but use the gas burner for heating and venting system to remove the products of combustion. If there is a need for hot water (the tap is open), the thermostat located in the gas control valve reacts allowing the gas valve to open the gas so the igniter can light the gas burner. A cold water that is delivered to the tank through the dip tube is heated at the bottom, where the gas burner is located. Hot water is now moved to the top from where it is delivered to the tap, shower or any other application (through the outlet tube). The products of combustion are transferred outside using the venting system, which can be atmospheric, direct, power or power-direct, using the inside or outside air, and removing gases naturally or forced. When the thermostat is satisfied, the unit is not working. But when the temperature of the water drops below the set, the unit turns on. Note: For a gas water heater to operate correctly there must be an unobstructed water and gas delivery, including electric supply (if it is required), the water tank should be filled with water, the proper amount of air delivered and exhaust gases removed. This gas water heater troubleshooting guide is not meant for one specific brand or model; but it covers popular manufacturers such as Rheem, AO Smith, Bradford White, State, GE, Kenmore, American and other. If you find problems, which are not presented in this troubleshooting guide, and you cannot solve them, it is recommended to contact a licensed plumber. If looking for the replacement parts use the genuine elements or from the trusted name, with the same characteristics and per manufacturer's specs. Regular maintenance and clean environment should be the first thing to consider when troubleshooting a gas water heater.